Other Distinguishing Features: Rex Dexter’s brain was removed from his former body and encased in a robotic body that resembles his Battle Tank armor. Rex Dexter was a brilliant scientist whose radical experiments allowed him to develop a powerful suit of armour that would allow him to fight crime. Taking the name Battle Tank, Rex joined forces with a number of superheroes to form the Fighting Force. This young group of heroes was led by the WWII veteran superhero SuperPatriot and their accomplishments soon brought them to the attention of the United States government. The Fighting Force was transformed into the Liberty League in the 1960s and the government provided official backing, both politically and financially. Unfortunately, a clash of egos occurred between SuperPatriot and Battle Tank which resulted in the Liberty League losing it’s leader. This ultimately led to the disbanding of the team and the fading to obscurity of Battle Tank. Rex Dexter had continued his research, remaining in relative obscurity but helping out the world where possible. He had trained a replacement for himself in Sterling Mason, the second man to take on the identity of Battle Tank. Operating out of Chicago, Rex made himself available to Frank Darling who was the unofficial leader of the remaining human population. Unfortunately, Sterling Mason went missing alongside his daughter, Lexie Dexter, into the Void, or Dimension-X. He was unable to go in search of the pair as he had uncovered the plot of the Atlantean to unite the world’s waterways using the Grokk to create tunnels through the Earth. Rex Dexter was unaware that Mako had killed the Atlantean and ended his threat already. When the Dragon went looking for help in his efforts to overthrow CyberFace, Frank Darling introduced him to Rex Dexter. He provided invaluable technical assistance in the assault upon the White House in return for the promise of searching the Void for his missing daughter and protégé. Rex also created a computer virus that would annihilate any presence of CyberFace’s programs that remained on Earth once he had been contained aboard Vanguard’s starship. The mission into the Void went badly wrong when Dragon got himself stuck in one of Deathseed’s stasis pods where he remained for two whole years. It was only when a team consisting of other heroes arrived to rescue him that Lexie Dexter could be returned to Earth, but Sterling Mason remained missing. The resulting reunion did not last as the young woman was suddenly consumed from within by strange creatures who then bit Rex Dexter before Dragon killed them all. Despite the terrible loss of his only relative, Rex Dexter managed to keep active by once more serving as a member of the Liberty League. Battle Tank created a number of devices which were crucial to defeating Universo in this timeline. His primary concern though was the safe return of his long-missing replacement. 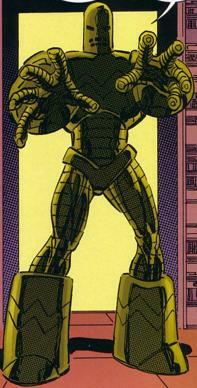 Eventually, Battle Tank could not wait any longer and left his original armor behind while he set off into Dimension-X. This second suit was passed to Alex Wilde while Rex Dexter began mutating into an alien life form. A rescue mission by some of the Liberty League not only recovered their veteran member but also uncovered the secret that Sterling Mason was now Deathseed. Rex remained in this form and managed to clear the name of Horridus, whom he had begun a relationship shortly before his physical body was impaled. He was surprised to discover that he now had a daughter, Dixie. Rex and his family were then exiled out into Dimension-X by Emperor Kurr when he took possession of the scientist’s laboratory. Rex and his family traveled through Dimension-X for quite some time until they were found by Robot Rex who had turned and new leaf and sacrificed his life so Rex and his family could escape the planet. Rex soon ran into Glum who in exchange for Rex nursing a wounded Angel would send Rex and his family back to Earth. Glum honored his word and sent them all back to Earth. Later, Malcolm and Angel seek out Rex to help deal with the Tyrrus Combine’s invasion of Earth. He is able to get them in contact with the Gods who send AllGod to end the invasion. He is next seen briefly as a witness at Dragon’s trial as he tries his best to defend Dragon. When Malcolm and Maxine visit Rex and his family, it is revealed that they are all joining the SOS and moving to Washington D.C. and are already in the process of moving. Malcolm asks for Rex’s help in locating The Claw, but Rex states that he can’t locate The Claw as he has never examined him before. Rex later helps Malcolm try to arrest Glum and during the process Rex kills Angel Dragon. Glum then kills Rex by smashing in his head/brains.